In July 1870, Napoleon the Third, the ailing French Emperor, was goaded into rashly declaring war on his Prussian neighbours. At the time, it was not an unpopular decision. Whilst Paris went into raptures over the prospect of at last bringing these "upstart" Germans to heel, the French army confidently began to mobilise for what was expected to be a glorious war of conquest. Unfortunately, it soon became clear that not all was going to plan. The mobilisation, which was planned to swiftly bring the maximum number of men to the border with Germany, turned out to be a shambles. Soldiers recalled to the colours were being shunted around France in search of their Regiments, whilst exasperated officers on the frontier waited with growing despair for the arrival of their allocated units. "Have arrived in Belfort", one general telegraphed to his superiors, "Cannot find my brigade, cannot find my divisional commander. What shall I do? Don't know where my regiments are". As it turned out, this was no way to commence a war with one of the most formidable armies ever assembled. It was quite understandable therefore, that within six weeks, the Prussian army and its German allies had surrounded, captured or killed ninety percent of the French field army, and paved the way for an inevitable crushing victory in 1871. When the debris of defeat finally settled, one outcome was a steely determination that the chaos of mobilisation would not be repeated next time - with most having no doubt there would be a next time. Accordingly, the deficiencies of 1870 were meticulously analysed, and a number of sweeping changes instigated to prevent them occurring again. One of the key provisions was laws that established a true universal military service. Under the "Three Year's Law" of 1913, all nineteen-year old able-bodied Frenchmen were liable to start a military service that would last for the next twenty-eight years. The first three of these were served with the Active Army, in a full-time capacity. At the end of this period, they were released from the army but retained for the next eleven years as a member of the Active Army Reserve. At the age of thirty-three they became a member the Territorial Army: part-time soldiers intended for more static duties. Seven years with the Active Territorial and seven with the Territorial Reserve followed, until at last, at the age of forty-eight, a man was released from his obligations to "La Patrie". Given these demands, it was practical - and undeniably reasonable - for most men to carry out their military service with a regiment based in their immediate region. In the event of a mobilisation order being issued after they had served their first three years, they were legally obliged to report for duty at their regimental depot prior to being despatched to the front. This obligation was extended to those French nationals living or working outside of the country, with severe penalties awaiting those who disobeyed. By the summer of 1914, a sizeable population of French nationals were living in the Channel Island of Jersey. 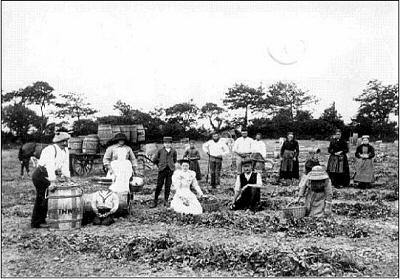 For the most part, they worked in the Island's agricultural industry, which had developed a considerable export market based on its cattle, and more significantly, the Jersey Royal potato. Needing to supplement local labour, the Jersey farmers had turned to nearby Brittany where there existed a willing pool of impoverished agricultural workers. Not surprisingly, once in Jersey, they were expected to work long hours and put up with fairly basic living conditions. In his memoirs, Edward Le Brocq recalls that: "On the farm a 'domestique' was nearly always a Frenchman. He had a pretty rough time of it; getting up early to milk the cows, working all day, go to bed late." But this did not seem to deter them coming - or staying in the Island: by 1911 there was some 5,610 French nationals present, representing almost eleven percent of the population . Of course, given that their principle purpose was manual labour, a considerable number of these would have been men within the Military Service age bracket; ready for the call up, if and when the need arose. It was four o'clock on the afternoon of Saturday the 1st August 1914 when the first poster appeared in Paris announcing the French government's decision to mobilise their army. In view of the deteriorating situation in the east, and the obvious signs of German belligerence, they could wait no longer. Whilst Parisians crowded round to take in the momentous news, the order was being telegraphed out to communities throughout France and the wider Empire. French embassies and consulates throughout the world were also to be notified: the war that everyone expected - and many longed for - was starting. In Jersey, there was a palpable sense of anxious anticipation amongst the French community. The threat of war had increased considerably over the last few days, leading to the Island's Militia being called out on the 30th July - as a precaution "in view state of feeling amongst the European Powers". To many French it seemed only a matter of time before their government's order to mobilise was issued; others were more sanguine, trusting that it would all blow over. On the afternoon of the 1st August, both camps were represented in the crowd of foreign nationals gathered outside the offices of the Jersey Evening Post in St Helier's Charles Street waiting for the news to arrive - and hoping it wouldn't. It had been a warm day in the Island, and when by five o'clock nothing was heard, most were glad to slope off and celebrate with a cooling drink. But any elation was premature. Just after six that evening, the office telegraph flickered into life, and the widely anticipated mobilisation order arrived. Recognising the gravity of the news, it was relayed without delay to the home of the Island's "Consul de France."